Here’s a little number I made up on the go for a delicious and healthy weeknight supper. 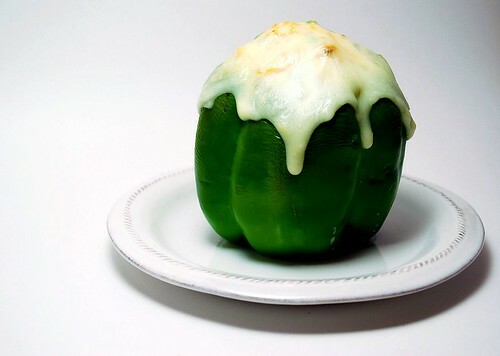 So you’ve seen Italian stuffed peppers, well what would an “American” version look like? Something like this. A creamy filling of chicken and rice crowned with a gooey dollop of white American cheese. It’s definitely a different combination of flavors, but they come together beautifully. Preheat your oven to 375 degrees and grease a large baking dish or baking sheet. Clean and core your peppers, being sure to get out the vein in the center and all the seeds. Make sure your rice is properly cooked, and shred your chicken breasts. het a medium skillet over medium heat and spray with cooking spray. Toss in your onion and cook for about 2 minutes, until onions become fragrant and begin to turn translucent. Add chicken, rice, peas, garlic, pepper, sage, Worcestershire, condensed soup, and milk, stirring to combine. Cook for about 3 more minutes, just to combine and heat through. Spoon the chicken mixture into the prepared peppers, heaping the filling on top if necessary. Bake for about 20 minutes. 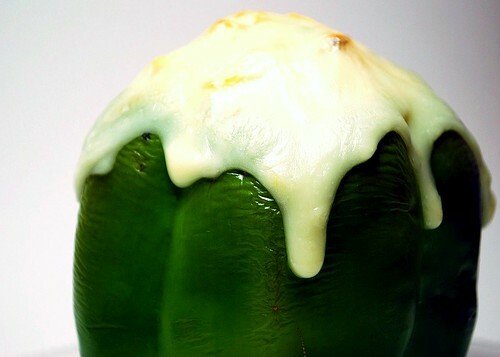 Remove from the oven, and top each pepper with a slice of American cheese. 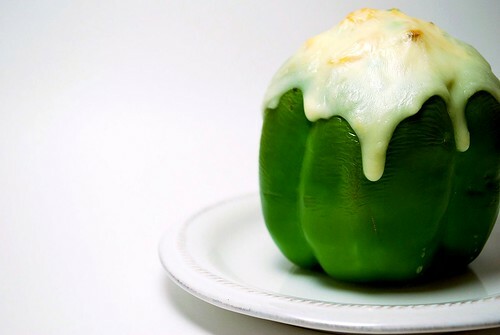 Turn your oven up to broil, and return the peppers to the oven for 2-3 minutes, until cheese melts and begins to brown. Serve immediately.